You will have to bear with me; I will be jumping all over with the posts for a bit. There are so many things that have stopped me in my tracks the last 10 days, I truly do not know where to begin. Unfortunately, I have misplaced the cable to my camera so some of this has to wait to be shared. Thank goodness for the iPhone and its trusty camera. The hotel overlooks terraced rice fields and the mountains in the beautiful Mae Rim Valley. I have to admit I have never paid attention as to how rice was actually grown but the rice paddies are so peaceful and beautiful. 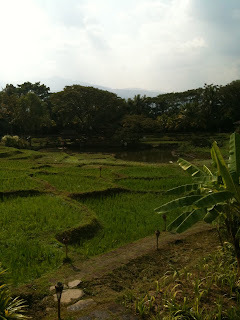 Below is a photo of the rice paddies and the gardens that surround them. It is breathtaking. 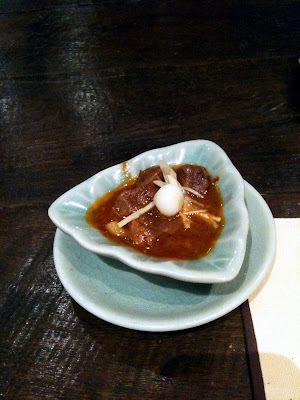 Last night we sat at the chef's table for a 15 course meal. 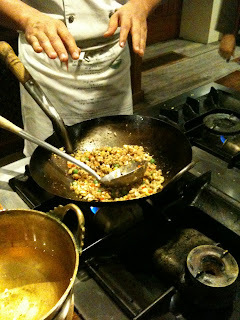 I love Thai food..... now I really love it ! I worry that once I return home it will never be the same.....picking up take out on the way home from work...I don't thinkg so....The lemon grass, garlic, ginger, coriander root, chillis, and scallions......to name just a few create the most delicous mix of tastes and sensations. We were taught last night to make fried rice and two appetizers....this is such an adventure. My fascination with this part of the world continues. 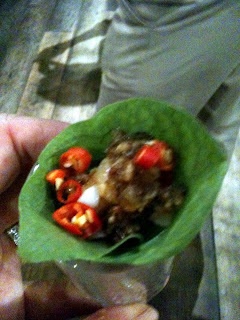 The first appetizer is called "Miang Kum" which is Thai leaf parcels with dried shrimp, cocount, lime, ginger, roasted cashew nuts, chilli and shallots with sweet and sour sauce. Unbelievable.....the hotter the better! The second was called "Kratong Thong" with was spicy chicken with Thai coriander and shrimp tartlets, sorry no photo...I got so excited I forgot to snap a photo. 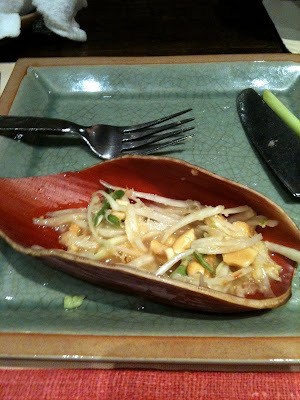 Som Tam, Green papya salad with beans, peanuts and garlic served on one of the outer leaves of the banana flower. It actually was very pretty...I started once again to eat, before picutre taking. 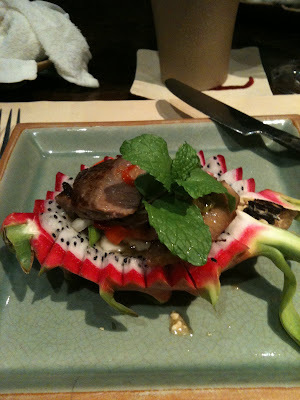 Yum Nua, grilled beef steak salad with chilli-lime sauce served on a dragon fruit. 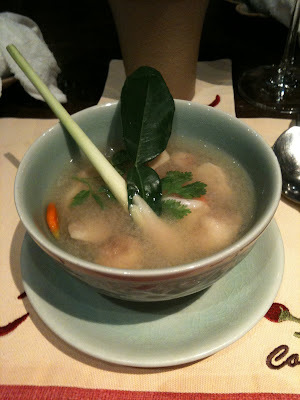 Tom Yum Kung Narm Khon, spicy lemon grass and prawn soup. Choochee Pla, red curry with fish and coconut. I'm missing a few courses but I think you get the gist. Last but not least dessert. 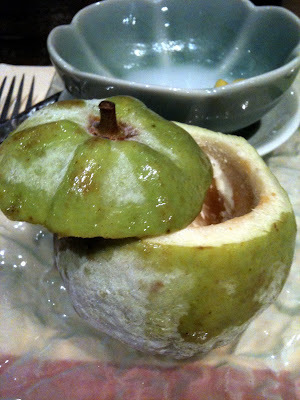 In the photo above is lemongrass ice cream servied in something similar to an apple. My favorite did not last long enough for a photo opp.....mango sticky rice with coconut sauce! 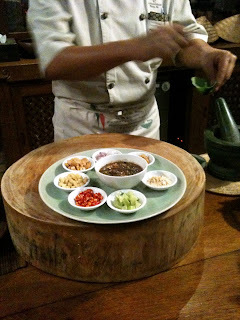 Cooking school tomorrow, starting with a 700 am trip to the local market! We can't wait! 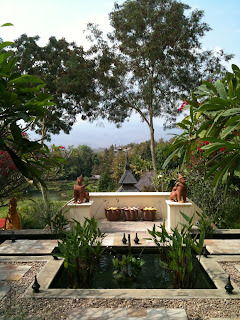 We hope you have enjoyed your stay at Four Seasons Resort Chiang Mai. Please let us know if we can help you with anything further in Chiang Mai or at any of our other Four Seasons Hotels in Thailand. Enjoy the rest of your trip.